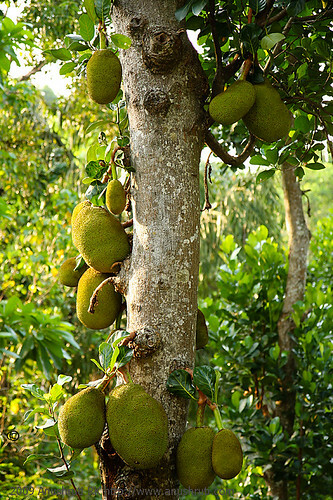 The ripe Jackfruit, with its amazing taste, aroma and texture has always been one of my favorite fruits. The most heavenly and delicious Jackfruits grow in my paternal ancestral home, where my grandmother, uncles and aunts live. It also happens to be my brother™s favourite fruit and rewind a few years ago, the trio at home (my sister, brother and me) would be delighted when the trunk of our grandfather™s car revealed this bounty from nature, straight from his farm. It was manna from heaven to us city-bred children. The Jackfruit has always been very special to me. I have relished the fruit as well as the amazing Indian preparations made from it. The kadubus (steamed dumplings made from a puree of ripe fruit, semolina and jaggery) that my grandmother and aunts make back home, my dear friend Pankaja™s mother™s raw Jackfuit Huli (a spicy, tangy curry eaten with rice), doddammma™s (paternal elder aunt) Sole saaru (a curry made with semi-ripe jackfruit) and my maternal aunt Rekha™s mouthwatering Jackfruit halva bring back a flood of fond memories to me. However it was only after marriage that I started to realize the true potential of raw jackfruit. Known as vegetarian meat in Bengal, its juicy, succulent and meaty texture gives the raw jackfruit an esteemed position in the vegetarian hall of fame. 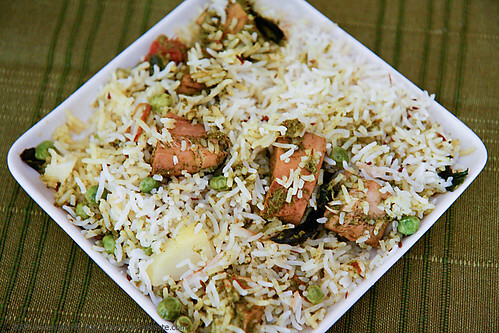 This pulao is a very special dish in my repertoire. I™m yet to experiment with other dishes like the raw jackfruit curry and other dishes that I can visualize in my mind. It so happens that whenever this green jewel lands up in my kitchen I invariably land up making the pulao instead of trying something new. 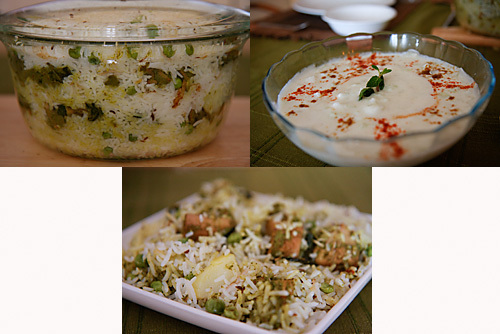 If one happens to ask Ro to list his favourite dishes, jackfruit pulao or pilaf would definitely be on the list. If we ever happen to be together in a vegetable market or the vegetable section of a store, his eyes simply light up when he spots a raw jackfruit and I know his next question. “Will you make a Jackfruit pulao for me?” We have never passed a vendor selling fresh raw jackfruits on Indian roads during our road trips without buying one. The thrill of spotting fresh fruits and vegetables, stopping the speeding car on the highway, chatting up with the vendors and of course buying their fresh produce is something that is very special to me. A very close and dear family friend of ours, whom we fondly call medha kaku, always freezes raw jackfruits when they are in season. When I was visiting her in Pune, I was delighted to find this in her kitty, which she very generously shared with me when I spoke to her about this pulao. Ever since, then I have been promising to give her this recipe. So, this is for you Medha Kaku and all my precious visitors to divinetaste. It is so enthralling to me that I can share my passion with all my family, friends and others through this little corner of mine. The ingredient list seems long, but once everything is assembled together the task is easier. Wash and rinse the rice in a colander in a running stream of water for about a minute or until the water runs clear and soak the rice for 15 minutes to ½ hr, with enough water to cover the rice. Assemble all the ingredients for the rice and cook in an electric rice cooker. Alternatively assemble all the ingredients in a pot or pan with a tight fitiing lid, bring the water to a boil, lower the flame, cover and cook for ½ hr or till done. You could also pressure-cook the rice, but this is not a foolproof method to get the perfect grain of cooked rice. In a pot or pan, cook the jackfruit pieces in lightly salted water until tender. Boil the tomatoes, and when cool peel the skin and chop them to small pieces and keep aside. Grind all the ingredients for the masala into a fine paste in a food processor, mixer or grinder. In a wok or pan heat the ghee or vegetable oil. Stir in the ground paste and cook for 3 to 4 minutes, until the raw smell disappears. Stir in the tomatoes with their juice and spice powders and cook till the oil separates. This should take about 4 to 5 minutes. Put in the yogurt, mint leaves, cooked jackfruit pieces, salt and bring to a boil. Cook for 4 to 5 minutes on a low flame until the pieces absorb the spices. Grease an ovenproof dish. Divide the rice into three parts and the jackfruit mixture into 2 parts. Place a layer of rice and alternate with the jackfruit mixture until you end up with the top layer of rice. Bake in a preheated hot oven at 200 degree centigrade for 15 to20 minutes. If you don™t want to use an oven, use a thick dish and place directly on the gas flame for 15 to 20 minutes. Serve hot with a raita or plain yogurt. What a coincidence Anu!! We just had jackfruit huli today for lunch and after that i visit your site to find this article. Wow!and i was acually wondering what other things can be made of this raw jackfruit. I will immidiately share this recipe with my mother. She will also be happy that you mentioned her huli. Yes love kathal pulao… & kathal is "brahmoner mangsho" :-). Very lovely recipe… hearing this after a long time & craving with some fresh kachcha kathal. I am very sorry to respond you late. I received your message on mobile 2 days later. As I was out of station in remote area where "idea" is not reachable. I was busy in doing our yearly free operative eye camp in konkan.We came back just yesterday night. This is realy a pleasent surprise after such a long wait. I am thrilled to read the receipe, but feel sorry that I could not bring a raw jackfruit while coming back. Now I have to get one good raw jackfruit and prepare the Pilaf as you say it. Thanks . take care . Hey Anu..this looks so appetizing even when your stomach's full.. i need to give this recipe a try too.. wonder if i will find a raw jackfruit here..
Soumya: I think you get tinned jackfruit in the US. Makes your job easier. Saves you from the tasks of peeling, cutting and all the accompanying sticky mess. Not sure of the taste though. If you try it let me know. In North India the furit is mostly used raw as vegetable. In UP especially it is made as "Katahal do payaza" or "katahal khada masala". It is one of the hevir veggies with lots of "mustard oil" in it. Also in some areas kebabs and biryanis are made from it. Anu..i finally found tinned raw jackfruit! cannot wait to try this pulav..will let you know how it turned out! I am trying to and get a restore to health for the sake this ringing in my ears. I grasp that this is a medical requirement but, this is getting gone from of control. I know that I should grasp a doctor but I just cannot provide it. I covet the ringing in my ears to depot already and paucity some recommendation from those on the forum here that can help. Do you know how to and get this ringing to stop? Hi Anushruti – I made this pulao with canned raw jackfruit the other day. It was absolutely mouth watering. My cousins loved it. Thank you for this and all the other recipes that I've been trying out with success :). Mamata- Thanks for the feedback!